The next flagship smartphone of Chinese company OnePlus will be named 'OnePlus 6T'. This is confirmed by different platforms. Actually, a separate page has been set up for OnePlus 6T on E-commerce site Amazon India. This phone in India will sell exclusively on Amazon. Apart from this, OnePlus India has made its first ad live for this smartphone, in which the brand ambassador of OnePlus Amitabh Bachchan has been shown. They have mentioned a feature of this phone in this advertisement. Apart from all this, the latest information is available on the Internet, according to which the OnePlus 6T dual rear camera will come with the setup only. Earlier this phone had the news of a triple rear camera setup. Beginning with Amazon's OnePlus 6T Landing Page on Amazon India. The listing of this phone comes with the name of the Coming Soon tag. It is written that this product will be Amazon Exclusive. There is also a notify me button. By clicking on this, users can sign up for the information related to the phone. In the photo, the phone has an in-display fingerprint sensor, which confirmed by OnePlus already. OnePlus 6T-Price, Specification & Features at Techtox Now: -A Oneplus 6T name has been confirmed from the television advertisement. It was live during the India-Pakistan match under the Asia Cup 2018. This video shows Vanplus brand ambassador Amitabh Bachchan. They point to the existing in-display fingerprint sensor in the phone, "a cooler way to unlock your phone". He further said, the new OnePlus 6T will come soon. Two slogans are also used in this advertisement. Both 'Touch for innovation' and 'Ready for speed' both point to in-display fingerprint sensors. 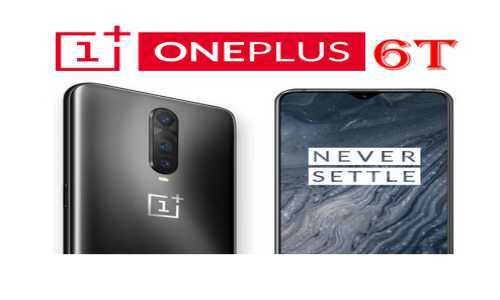 OnePlus 6T-Price, Specification & Features at Techtox Now: -At the same time, renowned Influencer Tipster Roland Quant has claimed that OnePlus will remain on Dual Camera set up in its second flagship smartphone this year. Earlier, there were claims of a triple camera setup in OnePlus 6T. In the rendered image used in this article, the smartphone is shown with Mirror Black Finish. Like the current flagship OnePlus 6, this phone will not have a fingerprint sensor on the back. It has also been claimed in the report that the new smartphone display will be a bit bigger. It will come with a 6.41-inch display with an aspect ratio of 19.5: 9. It has a resolution of 2340x1080 pixels. According to the old report, a OnePlus 6T smartphone will come with WaterDrop display Noch, 8GB RAM, 128 GB and 256 GB of storage, and a larger battery. Talking about the processor, the smartphone will come with Snapdragon 845 or along with 710 chipsets. The phone is expected to be launched in mid-October and the price can be $ 550 (about 40,000 rupees).